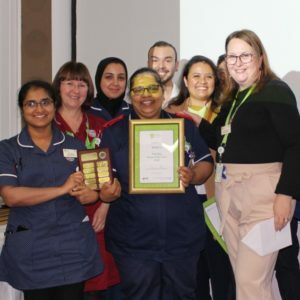 Midwives from the Luton and Dunstable University Hospital (L&D) and from around the UK celebrated International Day of the Midwife on 5 May with a conference to showcase best practice, and to present the Trust’s annual midwifery awards. Guest speakers included some of the leading names in UK Midwifery, made up of midwifery researchers, academics and specialists, who gave captivating and thought provoking presentations on a wide range of topics from professional practice to evidence based care. Topics included ‘Inspiring midwifery’, ‘Sepsis’, ‘Hypnobirthing, Antenatal support and preparation’, and ‘Staff well-being’. The annual midwifery awards, the first to be held at the L&D, were presented by Trust Chairman, Simon Linnett to Mary Edmondson, Jayne McLean, Piper Carla-louise, Michelle Causer, Giselle Cook, Elizabeth Godwin, Kelly Belcher, Christine Mcmahon, Tina Mccann, Emma Sherwood and Ward 32.